These black and clear crystal teardrop earrings are made by Monet. They are 2 icnhes long. 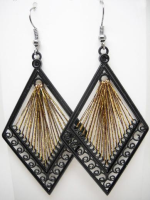 This pair of earrings are made from black resin and crystal in a gold plated setting. They are 2 inches long. These beautiful earrings are 4 inches long including earring wire. There is a silver bead finding at the bottom of the earring wire. They are handmade with black and lime green bugle seed beads. 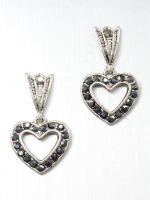 These black marcasite style earrings are 1-1/2 inches long and 3/4 inches wide. Look great with any outfit! These dainty black rhinestone earrings are 3/4 inches long. Beautiful with any outfit! These beautiful earrings are 4 inches long including earring wire. They are handmade with black, and clear teal czech beeds. Stunning! Metallic Silk Thread earrings made with Alpaca Silver wire , They are 2 inches long. Alpaca Silver wire is not sterling silver but it is an alloy of zinc, nickel and copper, it will not rust or tarnish. Handmade by Peruvian Artisans. 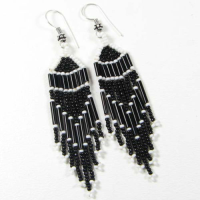 Black, White & Clear Earrings beautifully hand beaded with Czech Seed Beads. There is a silver bead finding at the bottom of the earring wire.They are 4 inches long including earring wire and 1.2 inches wide. 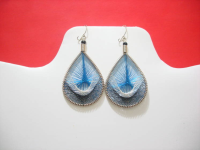 Blue silk thread earrings made with small multi colored beads. .They are 3-1/2 long x 1-1/2 inches wide. Metal is lead and nickel free. Blue and black silk thread earrings made with Alpaca Silver wire , They are 3 inches of length . Alpaca Silver wire is not sterling silver but it is an alloy of zinc, nickel and copper, it will not rust or tarnish. Handmade by Peruvian Artisans. 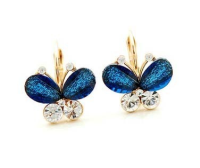 Dainty blue and clear crystalgold plated butterfly earrings are 5/8 inches long and 3/4 inches wide. Silk Thread earrings made with Alpaca Silver wire, They are 3-1/2 inches long. Alpaca Silver wire is not sterling silver but it is an alloy of zinc, nickel and copper, it will not rust or tarnish. Handmade by Peruvian Artisans. 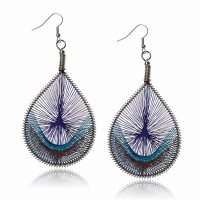 Blue metallic silk thread earrings with black wire. They are 2 inches long and handmade by Peruvian Artisans. 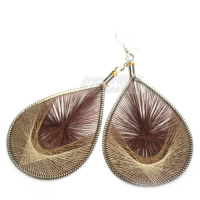 Metallic Silk Thread earrings made with Alpaca Silver wire , They are 2 inches of length . Alpaca Silver wire is not sterling silver but it is an alloy of zinc, nickel and copper, it will not rust or tarnish. Handmade by Peruvian Artisans. Fourteen tiny pink rhinestones adorn each earring. 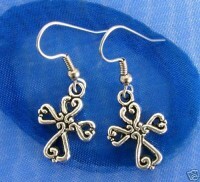 Silver ribbon is 5/8's inches long; total earring with wire is 1 inch long. 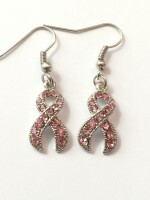 Perfect for breast cancer supporter or survivor! Silk Thread earrings made with Alpaca Silver wire , They are 2 inches long. Alpaca Silver wire is not sterling silver but it is an alloy of zinc, nickel and copper, it will not rust or tarnish. Handmade by Peruvian Artisans. Silk Thread earrings made with Alpaca Silver wire, They are 3 inches long. Alpaca Silver wire is not sterling silver but it is an alloy of zinc, nickel and copper, it will not rust or tarnish. Handmade by Peruvian Artisans. 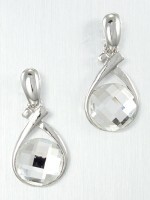 These silvertone drop earrings have a clear crystal lucite bead and are 1 inch long. 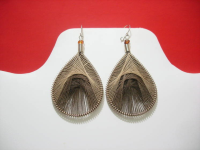 Brown metallic silk thread earrings with black wire. They are 2 inches long and handmade by Peruvian Artisans. 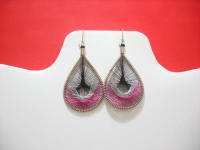 Deep pink metallic silk thread earrings with black wire. They are 2 inches long and handmade by Peruvian Artisans. 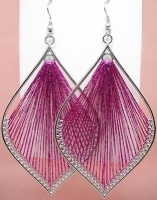 Deep Pink silk thread earrings made with silver wire. They are 3 inches long and handmade by Peruvian Artisans. 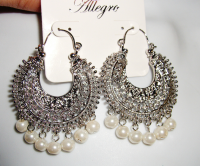 These silvertone vintage style earrings are made with faux pearls and are 2 inches long. 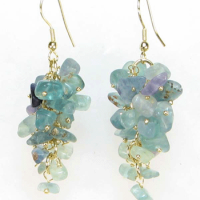 A cluster of natural flourite chips are 1-1/2 inches long. The hooks are goldtone. Stunning! 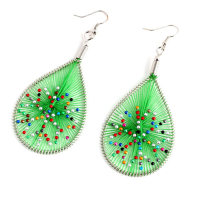 Green silk thread earrings made with small multi colored beads. .They are 3-1/2 long x 1-1/2 inches wide. Metal is lead and nickel free..
Earrings made from green, brown and white seed beads, green czech glass and faux brown pearls. They are 1-3/4 inches long. 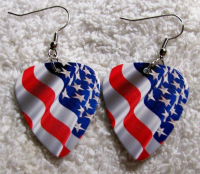 Guitar Pick with American Flag Earrings--- 3/4 inches long. Beautiful silvertone heart has one half with tiny crystals on it and center crystal stone. The other half is silvertone only. Posts are 1/2 inch. Very versatile! Antique silver hearts fashioning a 3/4 ich cross. Fish hook wire earrings. 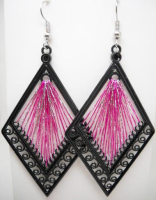 Great hand crafted earrings using czeck glass beads with intricate weaved tops accented with metallic pink / black triangle top. 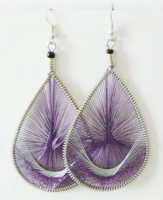 They are 2 1/2 inches with earring wire and x 3/4 inches wide. 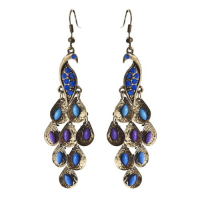 Burnished goldtone peacock earrings are blue rhinestones and light blue, teal and purple acrylic stones. They are 2 inches long. 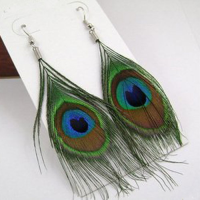 The hottest women's fashion jewelry of the season are peacock earrings. These earrings are 4-1/2 inches long. 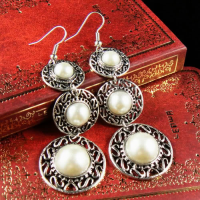 These graduated faux pearl vintage style earrings are 3-1/2 inches long from top of hook to bottom of earring. Fun and elegant! 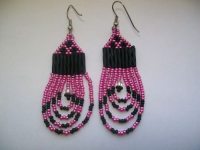 Pinks and black seed beads and silk thread Earrings. Beautifully hand beaded with Czech Seed Beads. They are 3 inches long including earring wire and 1 inch wide. 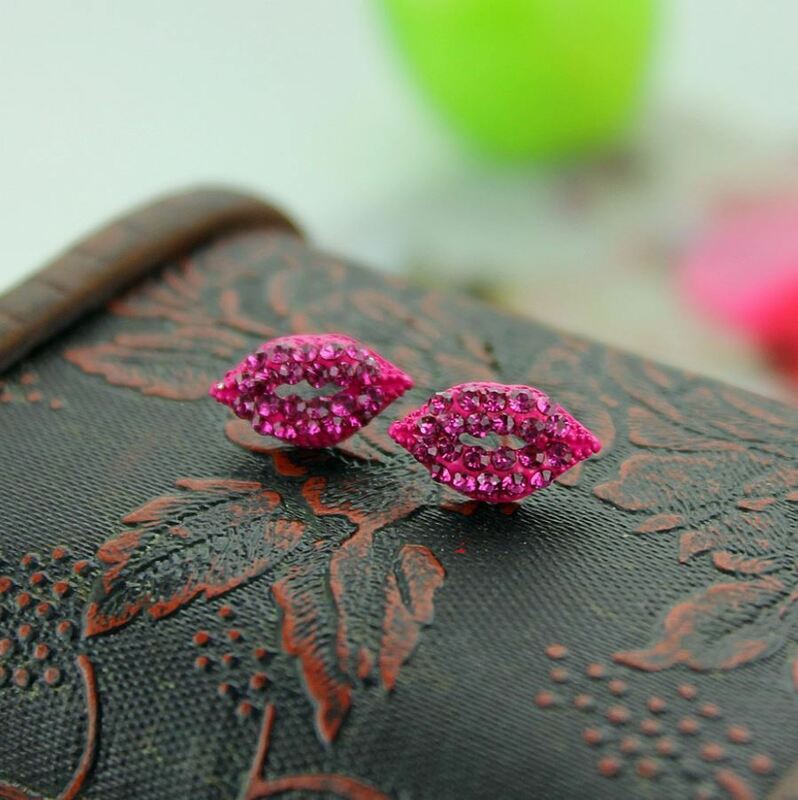 These Betsey Johnson lip earrings are made with pink lucite and a single rhinestone. They are 3/4 inches wide by 1/2 inch high. Great for fun or to promote your beauty business! 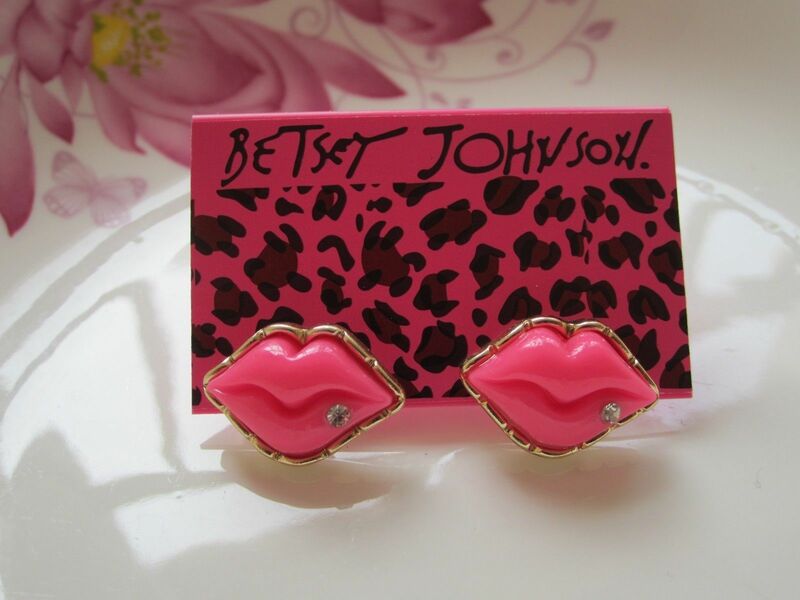 These Betsey Johnson dainty pink rhinestone earrings are 1/2 inch wide by 1/4 inch high. Great for fun or to promote your beauty business! 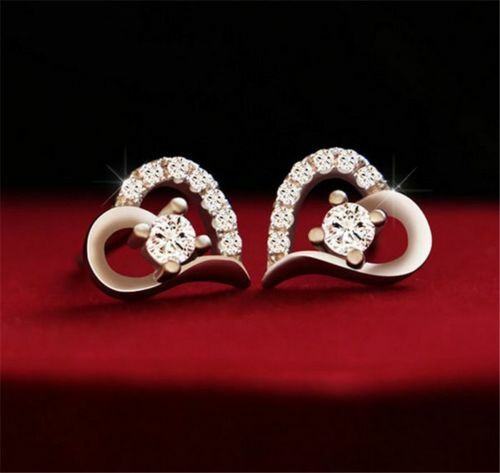 These earrings are made of rhodium plated and Austrian crystal. The trendy chandelier silhouette sparkles in an elegant gradation of crystals.They are 1-1/2 inches long. 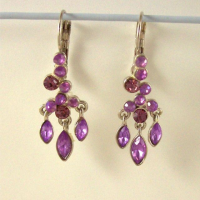 Dainty purple and clear crystalgold plated butterfly earrings are 5/8 inches long and 3/4 inches wide. 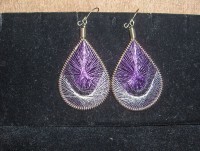 Purple silk thread earrings made with black wire. They are 3 inches long and handmade by Peruvian Artisans. 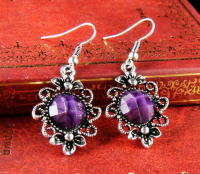 These retro style earrings have a purple acrylic stone and are 1-1/2 inches long. 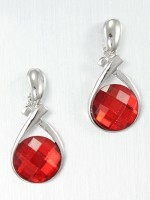 These silvertone drop earrings have a red crystal lucite bead and are 1 inch long. 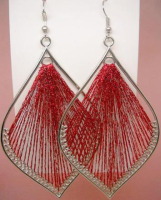 Red silk thread earrings made with silver wire. They are 3 inches long and handmade by Peruvian Artisans. Red White and Blue Patriotic Earrings beautifully hand beaded with Czech Seed Beads. There is a silver bead finding at the bottom of the earring wire. They are 4 inches long including earring wire and 1.2 inches wide. 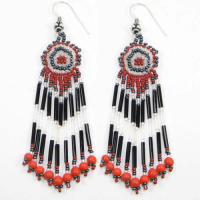 Black, White & Clear Earrings beautifully hand beaded, Native American Style with Czech Seed Beads. There is a silver bead finding at the bottom of the earring wire .They are 4 inches long including earring wire and 1 inch wide. 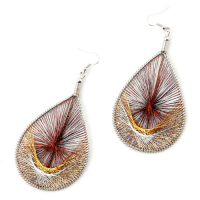 Metallic silk thread earrings made with Alpaca Silver wire , They are 3 inches of length . Alpaca Silver wire is not sterling silver but it is an alloy of zinc, nickel and copper, it will not rust or tarnish. Handmade by Peruvian Artisans. Sea Green, Black & White Earrings beautifully hand beaded, Native American Style with Czech Seed Beads. There is a silver bead finding at the bottom of the earring wire. They are 4 inches long including earring wire and 1 inch wide. 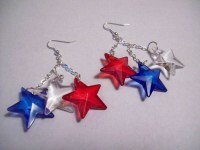 Red White and Blue Stars dangle from a silver-plated fish-hooks, connected by silver-plated chain dangle approximately 2=1/2 - 3 inches.. Silk Thread earrings made with black wire , They are 3 inches long. Handmade by Peruvian Artisans. 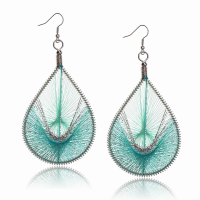 Teal silk thread earrings made with Alpaca Silver wire , They are 3 inches of length . 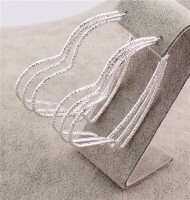 Alpaca Silver wire is not sterling silver but it is an alloy of zinc, nickel and copper, it will not rust or tarnish. Handmade by Peruvian Artisans. 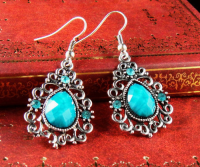 These retro style earrings have a teal acrylic stone and teal crystals. They are 1-1/2 inches long. 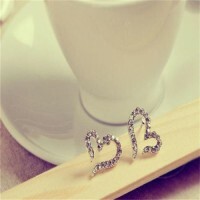 These triple heart earrings are 2-1/2 inches long x 2 inches wide. Has a design on the hearts. Very pretty! 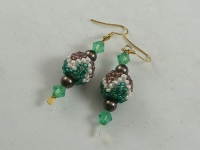 These handmade vintage earrings are made with white, pearl and green seed beads in a chevron design. They are 1-1/2 inches long. Great with any outfit! 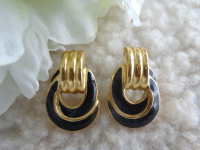 Vintage Signed "Trifari" gold tone black enamel 1 inch pierced earrings will accent any outfit! 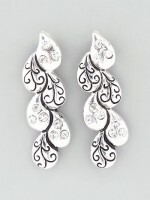 These silvertone earrings are 1-1/2 inches long. Very pretty! These beautiful earrings are 4 inches long including earring wire. There is a silver bead finding at the bottom of the earring wire. 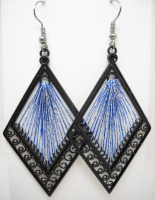 They are handmade with black and white bugle seed beads. These beautiful earrings are 4 inches long including earring wire. . 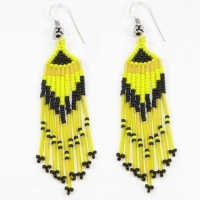 They are handmade with yellow and black bugle seed beads.